21 Savage is holding onto whatever privacy he can muster following his nightmarish encampment. 21 Savage is the latest and the greatest to cover Billboard magazine. To mark the occasion, the 26-year-old rapper agreed to an interview where he spared a few tantalizing details regarding his future prospects. For one, 21 is sitting on 2 full albums worth of material, beyond that he didn't divulge any details regarding the unfinished stencils for fear of spoiling the fun. Although 21 Savage and Billboard writer Gail Mitchell deliberated as if they were in conversation, the full-write up isn't in the traditional Q&A format. Mitchell took certain liberties in paraphrasing the material they were provided. 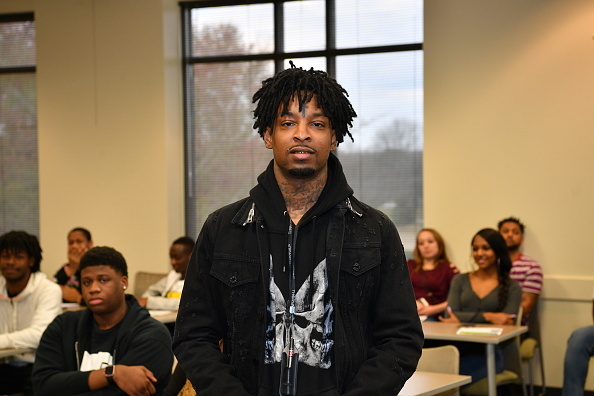 Besides the music he inadvertently just promised, 21 Savage also touched on the importance of philanthropy in the aftermath of his ICE detainment (yet to finalized, unfortunately). He was even quoted as saying that "eventually it [the ICE debacle] will be in the music." This Billboard interview might be the last in a long while because 21 Savage prefers his privacy (save for Social Media musings) and consequently, his 10-day detainment brought him a level of media attention he never wanted for himself. "I went from just being regular to my life being in the lens 24-7," his co-manager Kai Anderson delineated as the Billboard interview was being arranged. So, as it stands, 21 Savage will keep busy on the low. If you want to contact him or receive updates on new music, you'll be relegated to the Social Media peephole he's afforded us - at least for the foreseeable future.